Overall Size: 36 1/4" x 25"
Image size: 29 3/4" x 17 1/2"
It�s winter 1944 and the snow has brought a special quiet to the countryside in the late evening twilight. 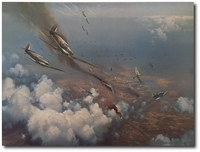 The war seems a world away until the ear-shattering roar of Merlin engines re-focuses the mind on the realities of war-torn Europe. 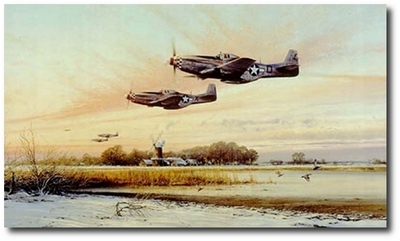 As dusk gathers and just feet above the gently waving reeds, P-51 Mustangs rush for home bearing the scars of the day�s battle; soon the tensions of aerial combat will be forgotten for a few hours, melting into an evening of camaraderie. Tomorrow will be another day.